Okay, okay, you all may be wondering where I've wandered off to... I'm not laying on the beach (unfortunately) and I haven't had another baby that I know of! If you'd like to see a big piece of what I've been up to, go here. And now for some happy Christmas leaves! My family has been celebrating "handmade Christmas" for years and I'm always on the hunt for new ideas. 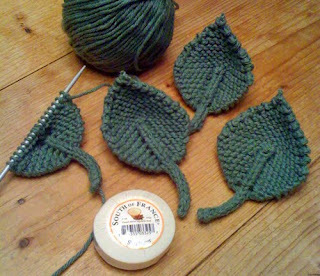 So you can imagine my joy when I discovered this pattern for knitted leaves. I'm not sure what they're supposed to be for, maybe embellishment, but I decided to knit them up in 100% cotton on #5 double point needles. Paired with a cute soap they make great natural face scrubbies. Hope that helps for all of you that are looking for last minute gift ideas!